"Bike racing" redirects here. It is not to be confused with Motorbike racing. "Bicycle race" redirects here. For the Queen song, see Bicycle Race. For the magazine, see Cycle Sport (magazine). Cycle sport is competitive physical activity using bicycles. There are several categories of bicycle racing including road bicycle racing, time trialling, cyclo-cross, mountain bike racing, track cycling, BMX, and cycle speedway. Non-racing cycling sports include artistic cycling, cycle polo, freestyle BMX and mountain bike trials. The Union Cycliste Internationale (UCI) is the world governing body for cycling and international competitive cycling events. The International Human Powered Vehicle Association is the governing body for human-powered vehicles that imposes far fewer restrictions on their design than does the UCI. The UltraMarathon Cycling Association is the governing body for many ultra-distance cycling races. 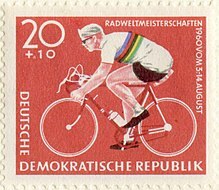 Bicycle racing is recognised as an Olympic sport. Bicycle races are popular all over the world, especially in Europe. The countries most devoted to bicycle racing include Belgium, Denmark, France, Germany, Italy, the Netherlands, Spain and Switzerland. Other countries with international standing include Australia, Luxembourg, the United Kingdom and the United States. The first bicycle race is popularly held to have been a 1,200 meter race on the 31 May 1868 at the Parc de Saint-Cloud, Paris. It was won by expatriate Englishman James Moore who rode a wooden bicycle with iron tires. The machine is now on display at the museum in Ely, Cambridgeshire, England. The Union Cycliste Internationale was founded on 14 April 1900 by Belgium, the United States, France, Italy, and Switzerland to replace the International Cycling Association, which had been formed in 1892, over a row with Great Britain as well as because of other issues. Road bicycle racing involve both team and individual competition, and races are contested in various ways. They range from the one-day road race, criterium, and time trial to multi-stage events like the Tour de France and its sister events which make up cycling's Grand Tours. The races typically take place from spring through to autumn. Many riders from the northern hemisphere spend the winter in countries such as Australia, to compete or train. Professional races range from the three-week "Grand Tour" stage races such as the Tour de France, Giro d'Italia and the Vuelta a España to multi-day stage races such as the Tour de Suisse and Tour of California, to single day "Classics" such as the Tour of Flanders and Milan–San Remo. The longest one-day road race sanctioned by USA Cycling is Lotoja which covers the 206 miles (332 km) from Logan, Utah to Jackson, Wyoming. Criteriums are races based on circuits typically less than a mile in length and sometimes run for a set time (60 min, 90 min, etc.) rather than a specific distance. Criteriums are the most popular form of road racing in North America. In Belgium, kermesses are popular, single-day events of usually over 120 km. As well as road races in which all riders start simultaneously, individual time trial and team time trial events are also held on road-based courses. Track cycling encompasses races that take place on banked tracks or velodromes. Events are quite diverse and can range from individual and team pursuits, two-man sprints, to various group and mass start races. Competitors use track bicycles which do not have brakes or freewheels. Cyclo-cross originated as a sport for road racers during the off season, to vary their training during the cold months. Races typically take place in the autumn and winter (the international or World Cup season is September–January) and consist of many laps of a 2–3 km or 1–2 mile course featuring pavement, wooded trails, grass, steep hills, and obstacles requiring the rider to dismount, carry the bike and remount in one motion. Races for senior categories are generally between 30 minutes and an hour long, the distance varying depending on the conditions. The sport is strongest in traditional road cycling countries such as Belgium (Flanders in particular) and France. Mountain bike races are held off-road and involve moderate to high degree of technical riding. There are several varieties; the main categories are cross-country and downhill but also 4X or four cross racing. BMX takes place off-road. BMX races are sprints on purpose-built off-road single-lap tracks typically on single-gear bicycles. Riders navigate a dirt course of jumps and banked and flat corners. Cycle speedway is bicycle racing on short outdoor dirt tracks, 70–90 m in length. Motor-paced racing and Keirin use motorcycles for pacing so bicyclists achieve higher speeds. Speeds achieved on indoor tracks are usually greater than those on roads. Other factors affecting speed are the route profile (flats and hills), wind conditions, temperatures and elevation. At a 2013 event in Mexico, François Pervis achieved an average of 21.40 metres per second (77.0 km/h; 47.9 mph) with a flying start over 200 meters. The top average speed over the men's 1 km time trial at the 2004 Summer Olympics was 16.4 metres per second (59 km/h; 37 mph) recorded by Chris Hoy. Average speeds clearly drop with increasing distance, so that over the 120 km Cootamundra Annual Classic it is 11.8 metres per second (42 km/h; 26 mph). In the 259 km 2010 Paris-Roubaix, Fabian Cancellara set a speed of 10.9 metres per second (39 km/h; 24 mph), while over the 818 km Furnace Creek 508, the speed drops dramatically to 8.3 metres per second (30 km/h; 19 mph). For an extreme road distance such as the 4800 km Race Across America, the average speed of the record holder is 5.7 metres per second (21 km/h; 13 mph), while the 2350 km Freedom Trail over mountainous terrain in South Africa is at a record speed of 1.9 metres per second (6.8 km/h; 4.3 mph). Mountain bike trials is a sport where riders navigate natural and man-made obstacles without putting down their foot, or "dabbing". It is similar to motorcycle trials. Points are awarded for bike handling skills. Freestyle BMX is an extreme sport of stunt riding BMX bikes. ^ Maso, B; Horn, M, Translator (2005). The sweat of the gods: myths and legends of bicycle racing. Norwich, England: Mousehold Press. pp. 1–2, . ISBN 1-874739-37-4. ^ "Road Bicycle Racing". Bicycle Racing. Retrieved 2017-08-04. 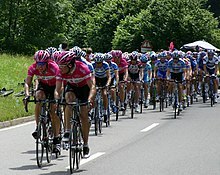 Wikimedia Commons has media related to Cycling (sport).